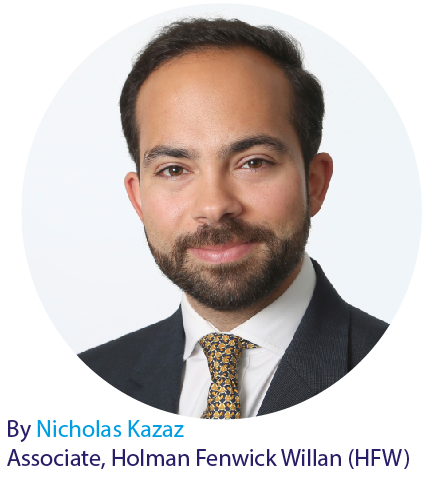 Nicholas Kazaz is an experienced international commercial dispute resolution lawyer at international law firm Holman Fenwick Willan (HFW), with experience of resolving disputes of subsea cable damage. Among others, he acts for and advises shipowners, charterers, energy companies, contractors, shipyards, ship managers and P&I Clubs. Over the past two years, the Club has seen eight damage to property claims allegedly caused by the snagging of fishing gear on subsea cables. Although the number of claims is reasonably low, due to the nature of the property suffering damage, the quantum of such claims is invariably high, sometimes reaching into millions of dollars. To raise awareness of such incidents the Club, in collaboration with Holman Fenwick Willan (HFW), has produced the following guidance which supplements our repository of dedicated fishing vessel publications (this includes the Fishing Vessel Safety Booklet, Guidance for fishing vessel owners operating in the vicinity of subsea cables and the Fishing Operations Sample Risk Assessment). Subsea cables have been laid on the seabed since the 1850s. Whilst the majority of recently installed cables are buried beneath the seabed, a percentage of cables are unburied, which are then at risk of being scoured out by tides and currents or being snagged by fishing gear. Once partially or totally uncovered, cables can become a risk to fishing vessels and equipment. What are the risks for a fishing vessel owner and which vessels are at risk? The loss of the trawler Westhaven in 1997 remains a stark illustration of the risk posed by obstructions on the seabed. One of the Westhaven’s trawl doors passed under, and subsequently became snagged on, an oil pipeline in the North Sea. Whilst attempting to free the net, the vessel capsized and all four crew members lost their lives. This casualty came in the wake of a succession of fishing vessels sinking in the late 1980s including Gaylord, Mhari L and Grey Flamingo, which were lost when their gear became fouled on subsea cables. Vessels most at risk from uncovered subsea cables are those with towed gear, bottom and beam trawls, and dredges. As demonstrated by the Westhaven sinking, at best, a snag on a cable will involve the loss of fishing time, equipment and catch. At worst it could entail loss of life and the vessel itself. In the case of the Westhaven, the Marine Accident Investigation Board concluded that attempting to pull the gear free, rather than the snag itself, caused a loss of stability and ultimately the capsize of the vessel. Subsea cable damage is very expensive for all the parties involved. The cost of repairing a subsea telecoms cable averages £750,000 and can be up to £10 million for a power cable. Given their importance, the consequential losses resulting from cable breaks are equally significant. For instance, in 2017 a cable break led to loss of power to the Isles of Scilly, while in 2016 a break severed Britain’s main power link with France. If a cable operator can prove negligence of the fishing vessel, then it may well succeed in recovering substantial sums in damages from the vessel owner. In the Canadian case of Peracomo Inc v Telus Communications Co (The Realice) a fishing vessel snagged nets on a fibre-optic cable. Thinking that the cable was non-functioning, and intending on freeing the gear, the skipper raised the cable to the surface and cut it with a chainsaw. The skipper was found liable for damages of almost US$ 1 million. Aside from civil liability, damage to a subsea cable can also expose a vessel owner to criminal liability. Under English law, the Submarine and Telegraph 1885 Act permits prosecution of persons who deliberately or negligently damage cables. The high burden of proof has meant that few, if any, prosecutions have been brought. However, in the light of substantive technological advances allowing for the identification of accused vessels, and the scale of damage caused by breaks, we may see future prosecutions brought against fishing vessel operators. What advance steps should a prudent ship owners take ahead of a voyage to minimise the risk of cable damage? 1. Correct navigation practices and passage planning should be implemented at all times. All voyages should be carefully planned. This can often be overlooked when operating in familiar waters. 2. The area in which fishing operations are to be conducted should be assessed before commencing the voyage and operations. charts are correctly planned and assessed. obstructions before the associated chart corrections are published. warnings. Further guidance can be found in Admiralty List of Radio Signals (Vol. 5). What other steps should a prudent ship owner take to minimise the risks of cable damage? on the vessel, above the waterline, as possible. parted at one end and the entire load being hauled from one warp present dangerous situations. 4.2.4 When a net becomes fast to an obstruction on the seabed (a fastener), the winch drum brakes should immediately be released. be lowered and brought inboard. The same applies to hoisting heavy or unknown weights in this manner. There is no clear answer as to whether a fishing vessel should carry out fishing activities over a known subsea cable. There are obvious risks as highlighted in this article, which may be mitigated by following good vessel management practices. Ultimately, it will depend on the circumstances in each case and will be something for the skipper/operator’s discretion. That said, fishing vessel owners should very carefully consider the afore mentioned guidance. If gear snags, Members are advised not to attempt to recover it. This avoids a Westhaven-type scenario. Instead, owners are advised to plot their location and alert the coastguard. The KIS-ORCA scheme distributes up-to-date plotting information to fishermen. So far as this data is installed in their fishing plotters and the appropriate authority is notified within 24 hours of their arrival in port, fishermen may be reimbursed for the cost of slipped gear. In slipping the gear, Members are less likely to incur potentially costly claims from cable operators and loss of life.